At 14-years old, Daniel Salazar, Jr. discovered Spanish classical guitar. He quickly fell in love. Today, Salazar holds both a bachelor’s and a master’s degree in music; he has studied guitar in Spain and performed in master classes with classic guitar maestros; he has established numerous musical programs; and, overall, has redefined Spanish classical guitar’s limits. 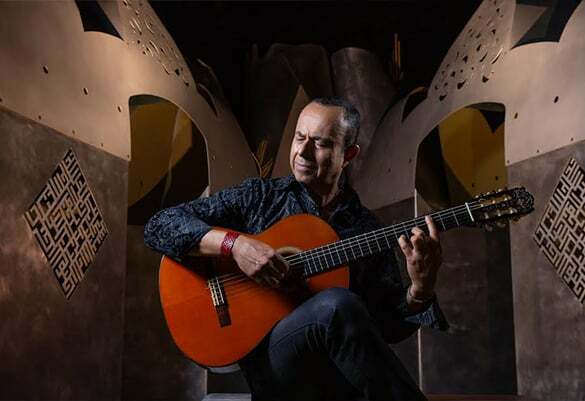 This Valentine’s Day, Thursday, Feb. 14, Salazar performed at Hoffman Auditorium at University of Saint Joseph in West Hartford, for a program titled: Romance De La Guitarra. Romance De La Guitarra was first realized 10 years ago as a collaboration with the university as a way to reimagine the concert experience—something Salazar has aimed to do for much of his musical career. The program exposes people to something they’ve never heard before—or at the very least, something they don’t hear a lot. For Romance De La Guitarra, Salazar brought a number of elements into the mix. A flamenco dancer and singer joined the performance, which Salazar says is “a rare thing that you don’t hear, especially around here.” Salazar’s group also wove in songs by popular bands like the Gypsy Kings as well as incorporate more classical Spanish music that uses Spanish rhythms. The performance also included a premier of a video that Salazar shot while in Spain, a compilation of music he wrote and arranged (an arrangement of Spanish and Latin classics).